Our Monogram team met and fell in love with designer Lauren Levant. Lauren is an up-and-coming, award-winning designer, and today we get to talk to her about her design background, projects, and inspiration. I became interested in design indirectly at a very early age. I studied fine art (drawing, painting, sculpture, and photography) avidly from the time I was seven years old. By the time I was in high school, I had become fairly accomplished in the fine arts, and everyone expected me to go on to study art professionally. But before I headed to college, I realized that I wanted to channel my creative energies into a more collaborative, dynamic platform that would keep me interacting with other people’s ideas every day. I also wanted to know that my work would make a measurable impact on others on a daily basis, and help them to live their best lives. The idea of creating artistic environments that people could live in became an answer to those things for me, and so I decided to earn my degree in Interior Architecture/Design. After thirteen years working in the industry, I feel lucky every day to have made this my career and my calling. I was fortunate to find that my move to Pittsburgh four years ago provided an opportunity to grow as a designer and business woman. I had been working in Connecticut, New York, and DC before then, and I wasn’t sure what the appetite for interior design would be in Pittsburgh before I arrived. Once here, I was thrilled with the excitement and support for my work that I found in this community. I have been involved in several exciting projects since moving, but my favorites are the ones where I have the chance to collaborate with local artists and craftsmen, and Pennslyvania is a rich, fertile ground for that talent. One such recent kitchen design collaboration featured a large, rolled steel cooking mantle, fabricated for the ventilation of a large Monogram range. The mottled blue markings of the steel hood are organic yet modern, and it gave this kitchen a unique touch that has a lot of meaning in our “Steel City” context here in Pittsburgh. It was gratifying to know that the clients are loving their new space, and it was also an honor to see this project receive two 1st place design awards this spring from the National Kitchen & Bath Association. SRFD: What do you enjoy about working with Monogram? One of the things I enjoy most about working with Monogram is the attention to detail – both in design and technology. The line features pieces that are consistently at the forefront of innovation. The smart cooking technologies in products like the Advantium ovens, or the Bluetooth-enabled induction cooktops make it possible for chefs of all ability levels to make incredible food consistently in their kitchens. They also instill confidence for cooks to try new cooking techniques. One of my favorite Monogram gadgets is the Bluetooth attachment for Sous Vide. I had the opportunity to try this out myself in the Monogram center at Chicago Merchandise Mart, and it convinced me that everyone should try, learn, and love cooking in the Sous Vide technique. Monogram’s technology makes it safe, easy and delicious every time – and that’s worth a lot to me and to my clients. SRFD: What’s a design trend you love? One of the design trends that I love right now is the mixing of materials – particularly multiple metals. Stainless is still king in the kitchen – but I’m loving the way multiple finishes are being mixed together successfully, and enriching the kitchen experience. Blackened steel, aged brass, bronze, nickel, and zinc – all finishes that can be blended and worked into a balanced design. 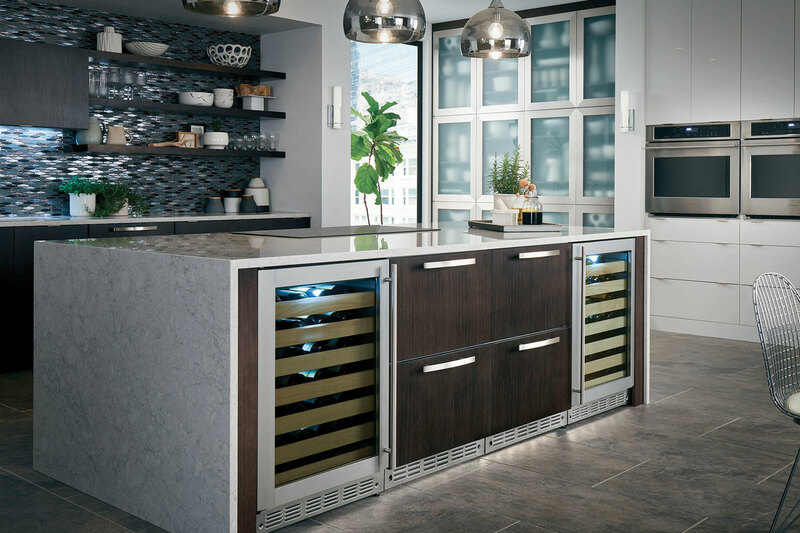 It started with decorative hoods, hardware, and plumbing – but these days, natural metals are also making their way into cabinetry, countertops, and open shelving. I look forward to seeing more of this mixed material approach in kitchen design in the years to come. One of the trends I’m ready to let go of is the wood planking trend – which has become fairly pervasive at this point. In residential projects, as well as in restaurants and bars – it seems like everything is getting planked and distressed to death. I loved the idea initially – but I think at this point, I’m ready to move on. Let’s not leave behind natural wood – but most of us do not live in a barn – so let’s keep looking for new, interesting and authentic ways to use it in projects in the future.